Completing a marathon is a physical feet that requires much preparation to safely accomplish. If you have qualified for the Boston Marathon on April 15, we hope you have built up your foot, ankle, and leg strength in addition to your stamina and distance. The many demands of running 26.2 miles can put enough stress on anyone’s feet, ankles and legs to create injuries. With proper marathon training you have built up your legs to withstand these distances, but neglecting any component of your stride can have disastrous results over this distance. We want to draw attention to your ankle today as it is one of the most common injuries to affect anyone. The motion at your ankle is primarily up and down as your run. Extensor muscles in the front of your leg lift your toes up as your foot leaves the ground and flexor muscles give you the push off that springs you forward. Medial and lateral ankle ligaments hold the ankle joint steady on the inside and outside portion of your leg throughout these motions. While these ligaments are holding your ankle in place they are not under much tension when running on smooth surfaces. Because these ligaments are not stressed with side to side motion as they would be in sports such as soccer, basketball and others, they can become weakened and fail with the slightest misstep. It is important to keep these ligaments healthy with variations to your routine. There are many exercises you can add to your routine to help strengthen your legs and ankles. Yoga is one area we have discussed before to strengthen, stretch, and improve the overall health of your legs and feet. Luckily many of the poses required in yoga demand balance, something that can force your ligaments to stay strong. 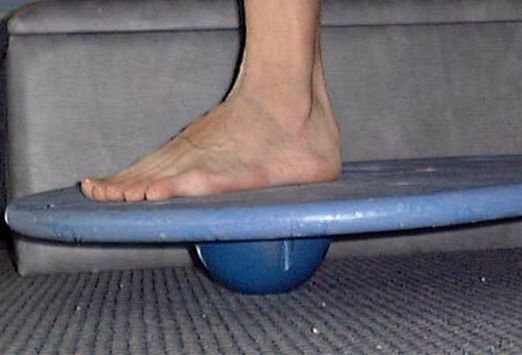 Balance exercises are actually a crucial part of rehabilitating an injured ankle. Often standing on soft or slightly unstable surfaces, like a trampoline or balance board, can provide enough resistance to keep your ankle ligaments strong and healthy. Including strengthening exercises in your training can be an important to preventing injury for any type of runner, but especially long distance runners.